1 WEEK CANCELLATION POLICY FOR GROUPS WITH FULL PAYMENT TO BE CHARGED. 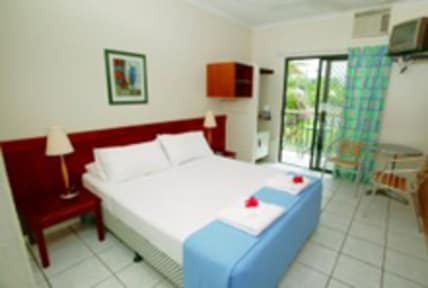 Bohemia Resort is Cairns premium resort hostel. Set on half a hectare of landscaped tropical gardens in the heart of Cairns, he Bohemia Resort offers stunning accommodation. Choose from an ensuite, a share facility, or a hostel style room with 4 or 6 beds, all air conditioned and some with private balconies. The hostel has a licensed bar and restaurant, Al fresco dining, a 20 metre salt water pool, and an air-conditioned TV room. We also have a new outdoor spa for the hot tropical nights set in lush tropical gardens & lit by gas flares. The spa is open till 9.00pm daily.